Vinyl Wall Mural Red telephone boxes and double-decker bus, london, UK. London is the third largest city in Europe. There are nearly 9 million people living there. That is quite a number! Moreover, it is one of the biggest financial centres in the world and you can find numerous banks here, as well as insurance companies, investment centres and one of the most influential media. Nearly 30 million tourists that visit this city every year. 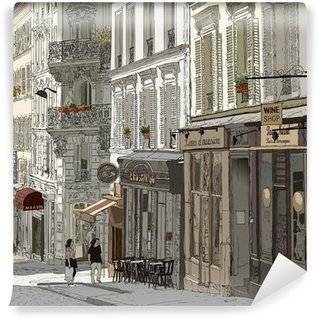 If you were there and you fell in love with this amazing city, you would like to go there, or you are looking for patterns inspired by London, you are in the perfect place! One of the methods of how to show the beauty of photographed object is to capture it in black and white. That is why if you are looking for a black and white London wall mural, you will certainly find the pattern here. There are places in this city which you should definitely see and that are hallmarks of this place: The Big Ben, The House of Parliament or The Royal Exchange. So, maybe you would like to have them in your house? 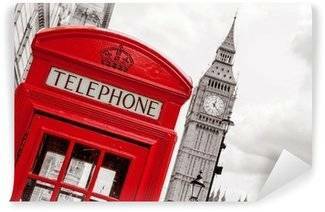 On each photo of those places, we have added a symbol of London: a telephone booth or the bus which were marked with the red colour. As a result, you can pick a wall décor that will look stylish, elegant and simply nice in every interior. It will look perfect in the bedroom, dining and living room or hallway of every fan of the English lifestyle. You can use themes from this category to introduce the London vibe into the business office of your language school, English tea shop or café as well as into shops selling British products. You will stress your interests and you will introduce cosmopolitan atmosphere to your house or business. Every city looks amazing by night and the same is with London. You can choose a graphic with London bridges at dusk which will look perfect in bedroom or living room. If you are looking for vintage and retro looking photos, you will find them here as well. But if you are looking for more symbolic wall decorations, you will not be disappointed either! There are graphics with the British flag which will look great in school classes. There are artistic variations on the most important places in the city incorporated or combined with the outline and colours of the British flag. There are motifs with red telephone booths and the Tower Bridge. That makes them an interesting choice for a teenager room. 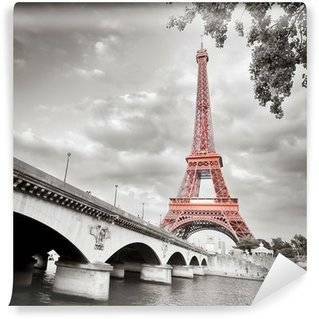 If you are undecided what you would like to change in your room, you can pick some collages. 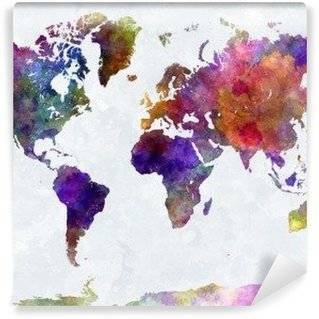 You can choose between graphic with colourful outlines of the most important London symbols and the one created from real photographs which will look interesting in every room or interior! Do not hesitate to change something if you feel the need to do it! Be brave! The biggest advantage of this category of patterns with photos of London is that there are a lot of options that you can choose from! You can pick something for your kid's room or for your own bedroom or business office. The variety of forms, colours and techniques used in London wall murals category makes them really inspiring and opens a lot of doors. You can personalise your living room and with ease express your interests. Patterns from this category make your imagination go crazy and awake the need for travelling. Let us inspire you!